For Trump, Turnbull and others, Assad killing his own people is okay, as long as it's not with chemical weapons, because then it constitutes "war crimes", writes John Passant. Last Tuesday, the Syrian dictator, President Bashar al-Assad, allegedly bombed Khan Sheikhoun – a rebel-held town in Idlib Governorate – with sarin gas. On Thursday, U.S. President Donald Trump responded by bombing the Syrian airfield from which those aeroplanes flew. Syria is a complex mix of local, regional, national and international issues and relationships. The six-minute video (above) gives a basic introduction to the recent history, while the Al Jazeera report, 'Syria's civil war explained from the beginning', is more in-depth. When the Arab Spring spread to Syria and threatened Assad’s dictatorship, he militarised the revolution by killing protesters. Yet despite the fact Assad had and has overwhelming military advantage over the democratic forces – especially since the Russians joined him in 2014 – and the fact he has allegedly killed more than 400,000 Syrians, driven four million out, with 12 million internally displaced or in need of humanitarian aid, and destroyed the country, the democratic revolution is not completely dead. It has burrowed underground. Its spirit lives. The sarin gas attack was Assad’s way of saying to those who resist his rule that there is no hope. I will use any means to destroy you. With the support of a major imperialist power, Russia, and other powerful regional countries like Iran and Hezbollah fighters, Assad feels safe in unleashing sarin gas. He may also see the use of the gas as a short cut to success with a tired army, supplies and inadequate resistance (both democratic and Islamist) that will not give up. Assad must destroy that resistance soon. The potential in the cities for a new democratic spring continues to exist – even if buried deep underground – and it could, despite and because of all his destruction, rise up again if Assad’s war against his people shows signs of faltering. Assad used chemical weapons in 2013 but the international backlash and Obama’s bluster about a red line being crossed forced him to refrain from the further use and pretend to give them up. It has not stopped him using other brutal means to kill hundreds of thousands of innocent men, women and children.
" ... go ahead with using barrel bombs, vacuum rockets, cluster bombs, phosphorus weapons and any kind, just not chemical weapons." Evidently, for those leaders now opposing the use of chemical weapons, Assad killing his own people is okay, as long as he does not use chemical weapons, because that is beyond the pale. I would have thought killing innocent people itself is beyond the pale. But that is the point. U.S. imperialism has killed millions, in Vietnam and Iraq for example, without compunction. It has been bombing ISIS in Syria for years, with estimates of over 7,000 sorties that have killed many innocent people. Hospitals in Syria, Iraq and Afghanistan have been bombed. Until recently, the Trump administration had no intention of removing Assad and tolerated his rule and mass murder. Now it appears they want Assadism without Assad — much as they got Mubarakism without Mubarak in Egypt. The alternative is Iraq Mark II. U.S. imperialism wants puppets (or occasionally uppity antagonists) running the region in its interests or not interfering too much with those interests. It fears the people of the region much more than it fears a not always compliant Assad. So last week, Trump was not about removing Assad. This week it appears he is. If you look at his actions, if you look at the situation, it’s going to be hard to see a government that’s peaceful and stable with Assad. Regime change is something that we think is going to happen. The imperialist war drums are beating from the U.S. and now the "other" side. "The Russian ship [the Black Sea Fleet’s frigate The Admiral Grigorovich] armed with cruise missiles Kalibr will visit the logistics base in Tartus, Syria." The Syrian air force bombed Khan Sheikhoun on Friday and Saturday — the same city that was attacked with sarin gas on Tuesday. This looks to me like preparing for war as a real possibility by all sides. Is there any solution? The U.S. bombing of Syria will not liberate the country. The U.S. ruling class acts in its own interests, not the interests of humanity. The invasion of Iraq shows that. The one million dead there show that. The consequent rise of ISIS shows that. The millions of refugees from Iraq and Syria show that. I stand with the Syrian revolution. I stand with the democratic forces against Assad, against Putin, against Trump, against Turnbull and his alter ego on this, Shorten — and against all the others intervening in the civil war there. Fine words. 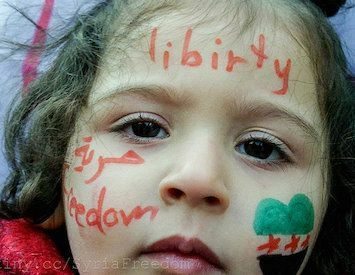 What can we in Australia do in practice to stand with the Syrian revolution now and when it rises again? It is almost certain Australian intelligence gathering (for example, Pine Gap) has been helping the U.S. in Syria, including the bombing of Khan Sheikhoun. Close Pine Gap. The Australian Government and Labor Opposition both support the U.S. in its seeming rush to war and may join it. The Australian ruling class does this not because it is a lapdog of the U.S., but because it judges it is in its own interests. Stop the wars. We have to end business as usual for our warmongers — as we did in Australia through protests and civil disobedience during the Vietnam War, for example. The same government (and opposition) that lock up, or will lock up, Syrian and other refugees in concentration camps onshore and offshore are now weeping crocodile tears about Syrian kids. Close the camps and bring all the asylum seekers and refugees here. Let them live in the community. That would be really caring about Syrian kids and other refugees — many of whom we have created through our invasions of Afghanistan and Iraq and our support for authoritarian and sectarian regimes, like those in Sri Lanka and Myanmar. Finally, we have to point out again and again that the Australian Government that attacks Syria attacks workers and the poor. The two are linked. There are limitless funds for war but nothing more for pensioners, public health, education or transport. The time to organise against capitalism’s wars and poverty is now. That means building robust and mass protests over time here in Australia to stop wars and bring the refugees here. Victory to the Syrian revolution. Down with tyrants! Subscribe to IA.